Ordering and sequencing are one of the areas of maths that preschoolers and kindergarten children are taught – doing hands on activities helps them understand the concepts and language involved in sequencing and ordering objects. We have quite a collection of dinosaurs at home ranging from large models to small pocket sized for play so taking them and organising them from biggest to smallest and smallest to biggest helped introduce some maths terminology as well as work on sequencing and ordering. I set out our dinosaurs in a pile and sat down with J and T separately as I was going to use two different strategies with them. With J (4 and a half and in Kindergarten) I wanted him to pick out a dinosaur and place in a line where he estimated it would be and then fill in with the other dinosaurs ordering them from biggest to smallest and following smallest to biggest. With T (3 years old and in preschool) I asked for her to find the biggest dinosaur from the pile of dinosaurs and place first in a row and then return to the pile of dinosaurs and pick out the biggest dinosaur again. We then repeated picking out the smallest dinosaur each time instead. 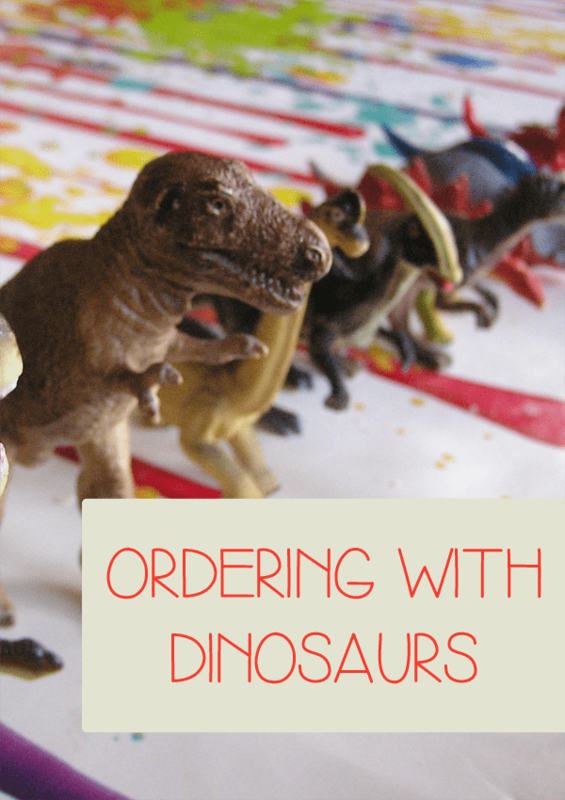 Check out our salt dough dinosaur fossil making for another dinosaur themed activity for preschoolers and kindergarten children. Great early math activity! Thanks for sharing with STEM Tuesday!